Being in the t-shirt business you often are perusing the net keeping an eye out for other cool t-shirt companies. It’s good to see whats out there, what kind of design people are coming up with, to check out your competition or just try to find yourself a cool new t-shirt. For me I really like to see good hand illustrated work. There’s so much computer generated work and silly logos and phrases out there. I want a t-shirt graphic with some meaning. I want a piece of art. A companies reason for being is important to me too. Who are these people? Why are they making t-shirts? What do they believe in? Having left a well paid design job to create an eco-friendly, socially conscious company from the ground up, I appreciate and look for the back story on a company. It’s important to support companies with the same values as yourself. There is a ton of mass produced, environmentally damaging t-shirts out there in the world. I’m not sure people even know how high the environmental impact of a standard t-shirt can be. There are many other considerations besides environment I take into account when looking at a company. The kind of screen print ink is almost as important as the fabric of the shirt and honestly a much more affordable move in the right direction for many small companies. Waterbase inks still have pigments but do not have the non-biodegradable medium that plastisol inks contain. (read my article on water base inks here) Many large companies use plastisol inks as they are easier to work with in a shop, however for the small studio printer waterbase inks have the extra added advantage of an easy non chemical clean up. I also look at where and by who a company’s t-shirts are made. The other major impact a standard tshirt has on the world is to the working conditions and pay of the people actually sewing the shirt. Luckily there are some unionized factories out there and more that are voluntarily policed by global human rights watch dog groups, so finding a socially responsible t-shirt is not as hard as it once was. Still many brands choose cost over people and go for the cheapest blank they can find. I think it’s worth my money to buy from a brand that chooses human rights over a few extra dollars. 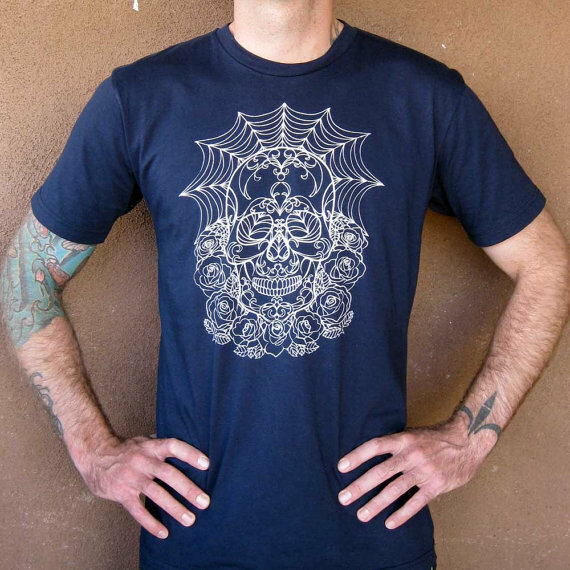 Flying Skeleton from Taos, New Mexico is one of my favorite new brands. 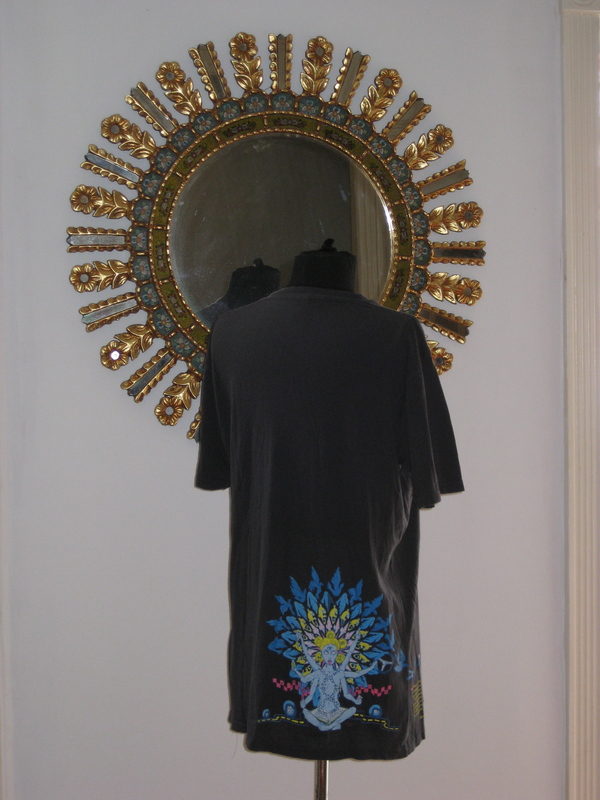 Produced by artists Bradley Sleep and Christie Swathe, the brand has a slight southwest vibe with very cool images. They screen print their tees one at a time in their home studio and use water based inks on socially conscious t-shirts produced right here in USA. Flying Skeleton is for everyone, in the spirit of unity, in that we are more the same than different. Regardless of nationality or politics, ultimately we can usually agree about more things than disagree. Basic things like food, shelter and clothing, equal rights and justice, the right to freedom, to be happy and healthy, and opportunity for bettering ourselves are important to us all.Flying Skeleton is a reminder of the time that we have on planet Earth, that we are all mortals here for a limited amount of time. Time, really, is our most precious resource. In the end, it’s not about the money we’ve made or our material gains, it’s about human relationships and the love received and given through them. Life is short, so make your indelible mark. Fly High. Waterbased screen print inks are not the norm in the industrial fashion screen print world. Plastisol inks are what most screen printing studios and large scale fashion tshirt printers use. Most people like to use plastisol inks because of convenience and durability. 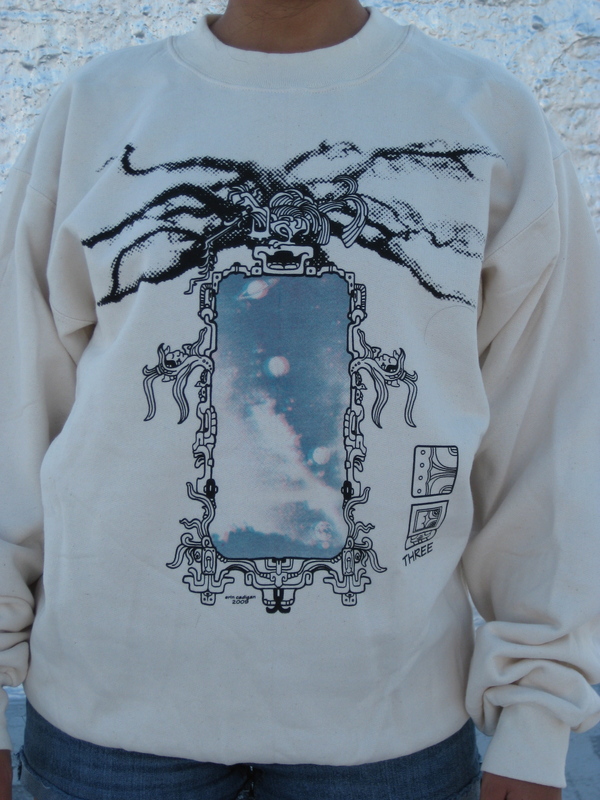 They are easy to print, do not dry in the screen, can be very opaque on dark garments, and will adhere to most textiles. That being said, they are terrible for the environment, large printed areas of these inks will feel like plastic sheeting against the body and like all plastics they do not bio-degrade, even as the fabric they are on might. Plastisol is created by PVC which is a polyvinyl chloride and a known carcinogenic, meaning it can cause cancer. Plastisol also contains phthalates. Phthalates have been associated with medical issues including mental disorders and infertility. As these phthalates wash down the drains at commercial print shops, these small molecules and toxins enter our water supply. Even the clean up on these inks creates the need for more chemicals to break them down. Waterbased inks are a whole different animal then plastisols. I won’t lie and say they are one hundred percent environmentally safe. There are few things in fashion or printing that are. However strides have been made by water based ink companies to create as environmentally sound a product as possible. The main concern in water based inks are the pigments used to color the inks. Pigments can be water bourne and be introduced into environments where they normally would not be found. The plus side is they have a very low impact, water based ink ingredients are lead-free, non-toxic and do not contain any heavy metals. They do not contain ozone-depleting chemicals such as CFC’s and HCF’s, or any volatile solvents. If used with a proper drainage system little to none of these very low toxic pigments will reach the water shed. Presently I use an earth-based drainage system allowing soil to trap and cleanse my waste water. I hope to build a charcoal, soil and grease trap custom drainage system for my studio soon. Clean up of the water based inks off of the screens require no cleaners at all. Just water. All colors are water based so equipment can be easily cleaned up with water. Water based inks do not contain PVC or phthalates, nor does it contain any toxic chemicals. There is no need to use solvents to clean the screens. As a designer I love the feel and look of a water based print. Waterbased inks will sink right into the fibers of a fabric leaving no decipherable stiffness or rough “hand” where printed. Sometimes the inks will start to dry a bit in the screens and create a stippled effect as you pull the ink through. If it’s slight I tend to leave it as I appreciate the look it lends the shirt. A small area of stippling can give the print a great vintage vibe. When learning printmaking in college we called this “happy accident” and learned to work with the look any medium was able to give. In early days of printmaking back when signs were hand pulled and newspapers hand set, printing was an imperfect art form. To me this feels more natural, real and interesting then the plastic uniform world we have come to know. Waterbased inks being less opaque then plastisols, which sit on top of the fabric, sometimes will also take on the hue of the shirt they are printed on giving a unity of design that’s beautiful. If printed on a light colored fabric colors in a water based print are often more vibrant than those in a similar plastisol print. Prints using waterbased inks can be just as durable as the plastisols. More so in fact. Plastisol inks can neither be ironed or dried in commercial dryers for concerns the print will crack, melt or burn. Waterbased inks can be cleaned any which way and the print which has sunk into the fibers and become one with the shirt, will last forever. I do table top printing. It’s an old school way of printing t-shirts that doesn’t require a press. This allows for a lot more variation of print placement. It also makes it nearly impossible to register colors on top of each other. Some people say it’s hard to do multi color prints with water based inks in general. Many print shops won’t change over to safer inks for this reason alone. I would like to say that Life Work LLC in California proves this theory wrong. Back when I was contracting out some of my more complicated designs, this company consistently returned to me professional, bright, clear prints done all with water based inks. At this point my line is all done by me in my own studio, including the printing. In the past I have worked with large print shops.